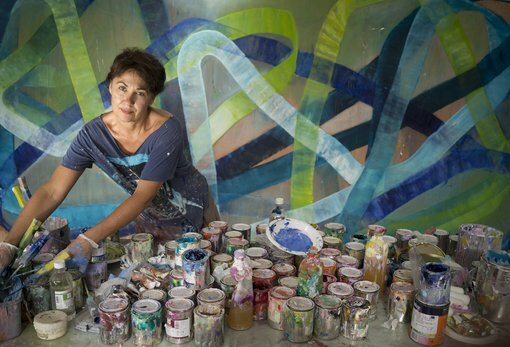 Widely exhibited across Australia for the past three decades, Kovacs is renowned for her grand abstractions that reflect a unique understanding of line, colour and rhythm. Her painting process is underpinned by great energy and movement. With a distinct lyricism, the artist uses rollers to apply paint to large plywood boards, allowing continual movement around her work, adding and removing layers over time. Strongly guided by her emotional responses, Kovacs’s intuition is central to her practice. Head Curator of Australian Art Wayne Tunnicliffe said he is delighted to welcome this stunning work into the Art Gallery of NSW’s collection and is ever appreciative of Bulgari’s support of contemporary Australian painting. “I have long admired the gestural brilliance of Ildiko Kovacs and I’m thrilled to finally have an exceptional painting by her in our collection. “ Onda 2015 exemplifies the artist’s innate understanding of colour and line, and further strengthens the Gallery’s deep holdings of Australian abstract art,” Tunnicliffe said. “Last year’s Bulgari Art Award recipient Daniel Boyd has just enjoyed time at our workshop in Rome and by all accounts it was a wonderful experience for both Daniel and the Bulgari team,” Harvey added. Winning artist Ildiko Kovacs said she is thrilled and honoured to accept the Bulgari Art Award. “I’d like to thank Bulgari for its support of artists and the artistic process. The Bulgari Italian residency will be a wonderful new experience for me. “When I start to paint I try to enter a space where preconceptions fall away, relying on my intuition to bring the unseen into the seen. My process is reworking the surface many times leaving traces of history which dictates how the painting will evolve,” Kovacs said. “Onda means wave in Italian. My studio is close to the ocean and the sound of the waves is ever present,” Kovacs added. Kovacs is the fourth recipient of the annual award which was first launched by Bulgari in 2012 in collaboration with the Art Gallery of NSW. The award consists of a $50,000 painting acquisition for the Art Gallery of NSW and a residency in Italy valued at $30,000. Previous winners include Daniel Boyd (2014), Jon Cattapan (2013) and Michael Zavros (2012). Ildiko Kovacs (b. 1962) is an Australian abstract artist who has been exhibiting professionally since the early 1980s. Her work is held in a number of Australian public collections, including the National Gallery of Australia, Museum of Contemporary Art Australia, and National Gallery of Victoria, as well as various private collections. In addition to her solo exhibitions at Martin Browne Contemporary, Sydney and Hugo Michell Gallery, Adelaide, Kovacs has been a regular finalist in both the Wynne and Sulman prizes at the Art Gallery of NSW. She graduated from the National Art School, Sydney in 1980. Kovacs is currently based in Bundeena. Bulgari was founded in Rome in 1884 as a single jewellery shop, whose magnificent jewellery creations soon became emblems of Italian excellence. Throughout the last few decades Bulgari developed into a global luxury brand renowned for its highly creative design in jewels, watches and accessories, and retailing in the major luxury retail precincts of the world. Up until 2011 Bulgari was majority-owned by the Bulgari family and, though it is now part of the LVMH Group, the Bulgari family are still instrumental in the management of the Bulgari brand and the design of jewellery. International success has carried the distinctive Bulgari design into a diversified portfolio of products and services and, increasingly, hotels.